It’s spring! Last year I shared with you my risotto using another spring vegetable, asparagus. Now it’s time for fresh peas. As I said last April: Delicious risotto does not have to be labor intensive. Although the cooking method for this risotto isn’t traditional, the result is excellent. Rosie and I helped develop this minimal-stir technique while working together at a client’s test kitchen. We’ve been cooking risotto this way ever since. The flavors of grated cheeses vary. Start with 1/3 cup, and then add more if desired. 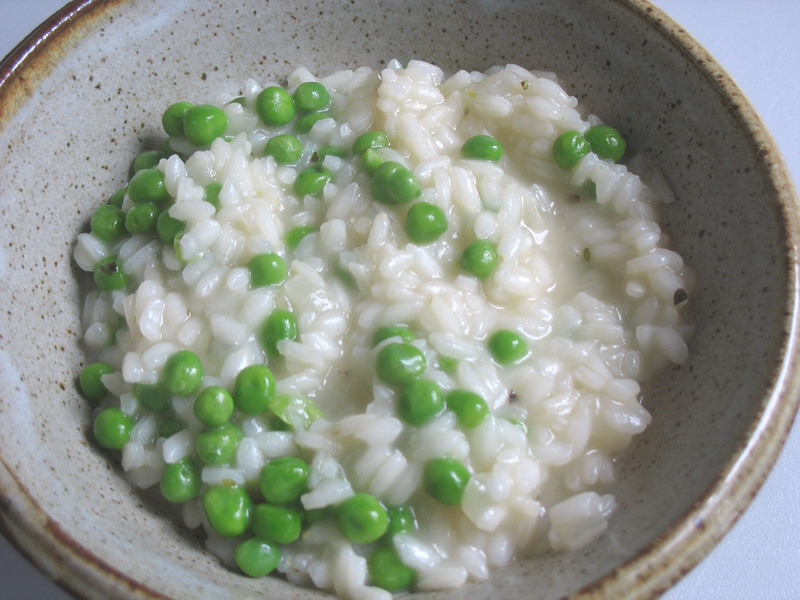 Serve risotto in 1-cup portions as a side dish or larger portions as a main dish. A pinot grigio or sauvignon blanc wine makes a lovely accompaniment. If you prefer to use table wine to make this risotto, use a light pinot grigio, sauvignon blanc or Chablis. Then follow the slightly altered directions below the recipe. In a 6-quart pot, melt butter with olive oil. Add onion, garlic and rice. Over medium-high heat, cook and stir 3-4 minutes; do not brown. Add cooking wine and broth. Increase heat to high and bring to a boil. Immediately reduce heat to low, cover and cook 10 minutes. No need to stir. Add peas, increase heat slightly and continue to cook uncovered about 3 minutes. Stir now and then. Taste rice to ensure it does not overcook. Rice should be al dente and rather soupy. Stir in cheese and marjoram. Remove from heat and serve immediately. Sprinkle with additional cheese, if desired. 1) After cooking and stirring the rice with the butter, olive oil, onion and garlic, stir in 1 cup Chablis or other light white wine instead of cooking wine. Cook until very creamy and almost all the wine is absorbed—about 2 minutes over medium-high heat. 2) Stir in chicken broth (or vegetable broth) and 1/2 teaspoon kosher salt. Increase heat to high and bring to a boil. Immediately reduce heat to low, cover and cook 10 minutes. No need to stir. Add peas as directed above. Petite frozen peas might be just as tasty as fresh, and a lot easier to prepare! Traditional risotto is very creamy and the rice is firm to the bite. The rice will continue to absorb liquid as it sits. The recipe may be halved; use a 4-quart saucepan.